I know I never posted final pics of the bathroom… but I will get to that. First up is a security enhancement. 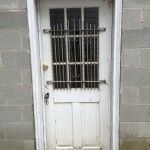 The basement door. A 4 year old probably could have kicked this old door in. 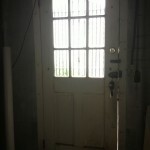 The door knob and deadbolt were connected to a piece of trim that was face nailed to the framing. So no, it wasn’t going to keep anyone out, despite the old bent bars over the windows. To replace it, we bought a steel door with a foam core. Everything was going great until I tried to fit it in the hole. Not only was it really tight on the sides, but it was 1/2 inch too tall. Of course they couldn’t build the door opening to the standard height… Anyways, I decided to trim 1/2 inch off the top of the door frame rather than trying to deal with removing the sweep or trying to cut the metal door. I also replaced the framing around the cement block with pressure treated lumber. I installed it and then… it wouldn’t close. It was getting late, so I slammed it real hard and called it a night. The next day I undid everything, chipped away at the mortar that was built up around the cement block and re-installed it all over again. So a 2 hour job turned into 2 days. It might have taken a while, but it’s way more secure now and we’ll be able to keep out any 4 year olds. Old door from the inside. New door. 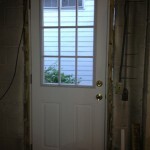 I still have to install new trim on the outside and caulk/spray foam the cracks (no light should be showing through).